The Beer of the Month of June is bestowed upon a beer from Knee Deep Brewing I discovered at the Santa Rosa Beer Festival this June 4th. Whenever finding an unfamiliar beer at a festival, I make a point of asking where it’s brewed. After inquiring the festival volunteer pourer the bottle in front of him with the initials “IRA” in big colorful letters, he picked up the bottle, squinted at the label, and finally informed my wife and I, “It says Belmont, California.” That was a surprise to us, since Belmont happens to be our home town on the San Francisco Peninsula. As I suspected, the beer is contract brewed by Belmont’s Devil’s Canyon Brewery. Knee Deep collaborated earlier this year with Devil’s Canyon and The Beer Wench to produce Ryedentity Crisis, a sensational Saison brewed with rye with great subtle berry flavors. It’s one of those special beers that on the first sip, made me freeze, raise my eyebrows, and exclaim “Wow!” out loud. It could’ve easily been Beer of the Month a few months ago. So I decided to give whatever was in the bottle labelled “IRA” from my home town a try, never mind the fact that the whole point of driving nearly two hours to Santa Rosa was to sample all the great beers brewed in Sonoma County. But then, just where is Knee Deep located anyway? Best I can tell, it’s contract brewed at Devil’s Canyon and possibly other locations given its scattered distribution along the West Coast, so there doesn’t appear to be a definitive “there” for Knee Deep. 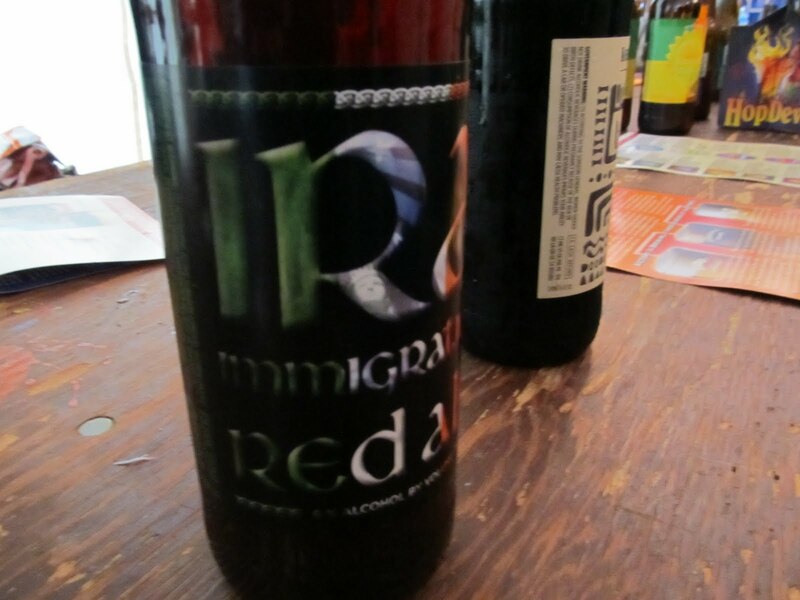 As for Knee Deep’s beer, it turns out the initials “IRA” stand for Immigration Red Ale, the name Knee Deep has given their Irish Red Ale. It’s a curious label choice, as “IRA” are also the initials of the notorious Irish paramilitary resistance group the Irish Republical Army that fought in an often violent enthno-religious-political conflict in Northern Ireland that started in the late 60’s and lasted thirty years known as The Troubles. An Irish Ale with “IRA” on the label may seem like an act of defiance, but more likely is merely a sign of the forward march of civilization, as the largely pacified and disbanded paramilitary group is but a distant and increasingly forgotten legacy of more contentious times, with “IRA” signifying nothing more than a beer’s name. Oh yes, this is supposed to be a beer review, which means I’m supposed to tell you how it tastes. Tasting is always a bit of a challenge at a beer festival, where brewers often try to one up each other with hop monsters, barrel aged specials, and unique beer styles full of strong flavors and sampling just a few of these beers inevitably leads to palate fatigue. And yet the straightforward composition of roasty toasty and earthy flavors that somehow blended seamlessly into a very smooth drinking beer distinguished it from a very distinguished group of beers at the Santa Rosa Beer Festival. But this time I didn’t freeze and say “Wow!”. It was more like a pause, and then I exclaimed to my wife “Mmmmmm”, which is still good enough to earn Beer of the Month status. Knee Deep Brewmaster Jeremy Warren is a pretty young guy, having graduated from University of Nevada-Reno in 2006, but he’s already won a bunch of awards and can demonstrably brew some excellent beer. If he ever decides to settle down and establish a brewery somewhere, I hope he builds it in Belmont, California. He's brewing now/bought the old Beermans location in Lincoln (past Sacramento off Hwy 80 towards Tahoe), so he has a location. He said his intent is to build a big brewery in Reno though and head back there at some point. Previous Previous post: Is Greed Environmentally Good and Other Questions from "Yes We Can!"